Originally, from Glasgow, Scotland, I travelled internationally for many years, especially in Europe, Russia, the countries of the former Soviet Union and the Middle East. I have lived/worked in Saudi Arabia, the British Virgin Islands, Spain and the Czech Republic. Since retiring, I frequently visited Southeast Asia but now live in Xàbia, Spain. My many leisure activities are related to Asian culture: bonsais, ikebana, Chinese brush painting, Chinese calligraphy and Tai Chi. I speak English, Spanish and French fluently, plus reasonable German. I began writing in 2011. All my books are available on Amazon & Kindle. ‘Nemesis in Spain’ was my first novel followed by ‘Nemesis in Asia’. My third novel ‘The Deadly Diplomat’ is a prequel to ‘Nemesis in Spain’. My travel memoir ‘Promise me you won’t go to Beirut’ initiated at the behest of my many grandchildren, relates to my experiences with Cuban revolutionaries, war-torn Beirut, the Shah’s Iran, and Portugal’s carnation revolution. My experiences in former Soviet countries after the collapse of Communism, and my inter-reaction with many significant events of the late 20th century. 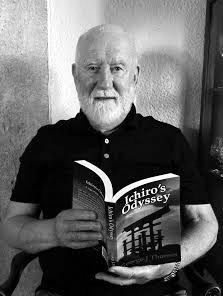 My fourth novel relates to my interest in Japan, which goes back many years and was stimulated by an unforgettable journey I made to that country, as the guest of a major Japanese corporation. I was fascinated by the harmonious juxtaposition of centuries-old traditions with twentieth-century technology. 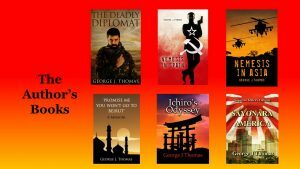 Against this background, I decided to embark on a literary expedition, taking the theme of Japan in the 1930’s and the tragedy of the Pacific War. The majority of my characters are fictitious but frequently set against actual historical events. I wished to contrast an ancient culture and its deep love of the natural world with the barbaric cruelty of war. Copyright © 2019 George J Thomas.